I'm currently pupating but The Crete Nature Blog will be back in the New Year. Hello, I’m a regular Betty on Steve’s Sunday strolls. We were just leaving home when I saw a message saying Steve was indisposed and unable to lead our planned Sunday Stroll. 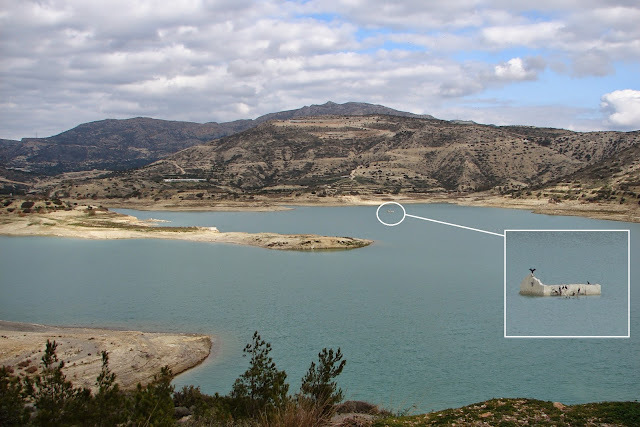 Undaunted, my Bert said, ‘Let’s go anyway, perhaps some of the others will miss the message and turn up.’ One of the reasons my Bert was so keen to continue with the stroll was to see just how low the water level in Bramiana Reservoir, near Ierapetra had fallen. This first photo was taken on our visit in January 2008, just before the winter rains set in. As you can see from the second photo, the drought this year was, and still is causing concern. Last winter in East Crete only delivered 25% of the usual rainfall. Betty and Bert looked dashing with their multi pocketed jackets, thick trousers and wellington boots. They also looked somewhat incongruous, as all of our similarly attired group did, as we trudged along the sandy beach between two rows of scantily clad sunbathers on sun loungers. Magnanimously ignoring the stares and giggles we eventually crossed the little bridge at the end and squelched our way along a marshy path through the Giant Canes to the river bank. A Western Caspian Turtle, Mauremys rivulata, surprised at the sudden appearance of our motley crew, faltered in mid stroke and dived into the weeds at the bottom. As we took it in turns to gain access to the river bank the remaining members of the party investigated the undergrowth. Bert suddenly dived in among a patch of smaller reeds and emerged triumphantly with a Praying Mantis, Mantis religiosa. “Do they bite?” asked Betty. “They can take a male's head off during mating,” I informed her. Last week we were looking for Griffon Vultures on the heights above Lasithi Plateau. We found some but they were flying very high. This week as we gathered on the forest road we were treated to the inspiring spectacle of nine of these magnificent birds not fifty feet above our heads. Standing half as tall as a man and with a nine foot wingspan they truly are awesome birds. Like all vultures they feed on carrion and will often circle around elderly animals that seem to have difficulty moving. As this accurately describes quite a number of our Sunday Strollers we considered it wise to move into the cover of the trees without further delay. As I dropped down onto the Lasithi Plateau a Buzzard launched itself from a telegraph pole, narrowly missed my windshield and crashed into the undergrowth to my left where it had obviously spotted its unwary breakfast. 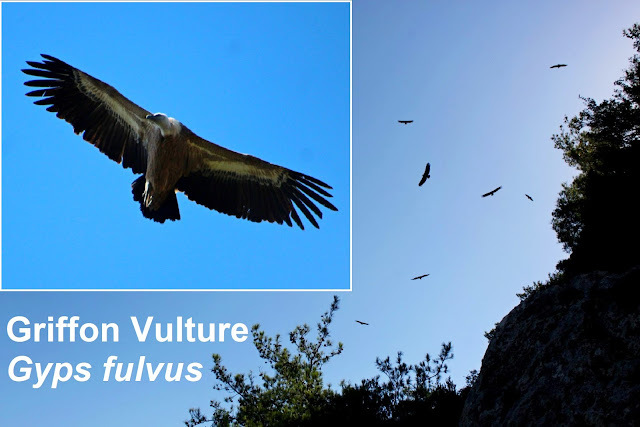 That was a good omen as I was taking my little group of intrepid strollers to the heights above Agios Charalampos to look for Grifon Vultures. The saint, after whom the village is named, was reputedly 114 years old when he was martyred for his Christian preaching in the 3rd century, thus making him the oldest saint and his claim to fame was that, whilst being tortured, one of his torturers arms miraculously fell off and another had his head put on backwards. I think that I am more inclined to believe in Betty's black snake but more of that later.